Eric Uslaner is perhaps the world’s leading authority on social trust. He was recently much in the news, as he is every year, with the annual publication of the General Social Survey on trust. Here are some headlines from our talk this past fall. Charlie Green: Thanks very much for speaking with me. We last talked back in early 2010. Now, most of my readers are accustomed to talking about trust in the sense of trustworthiness, like can I trust banks, or how can I get people to see me as trustworthy. Your approach is different. Let’s clarify that first. Eric Uslaner: That’s right, it is different. You’re talking about people’s perceptions of other people’s trustworthiness. There are two parts to that: part one is it’s a specific person or institution about which you’re having the opinion: the other is that we view trustworthiness as the active characteristic. I focus differently. I focus not on the perceived trustworthiness of specific individuals (or companies), but on the propensity of individuals to trust strangers, or people in general. It’s more about a worldview than about direct experience. And the GSS, which has included these key trust questions since the late 60s, consistently asks that kind of question: “Do people generally mean well,” that kind of thing. CG: What are the differences in looking at trust that way, as opposed to trust in banking, or JPMorgan Chase, or international banking? EU: There are two big differences, and they’re interrelated. First, social trust – what I’m talking – about changes far more slowly, over a longer period of time. Nowadays a third of Americans say that people generally can be trusted; 20 years ago that number was half. And in many ways it’s not because of a decline in trustworthiness – crime is down, for example. But what’s changed is people’s propensity to trust strangers. The second difference is that social trust, as I’m talking about it, is what we need to drive political societies. You’re not going to get problem-solving done in a pluralistic society by sticking with your own kind. Generalized social trust is what drives our institutions – not whether trust in banking is up or down last month. And on that measure, we’re in deep yogurt. CG: And how does social trust play out against these other forms of trust? EU: Most of the time trust in institutions (except for the military) tends to go up or down somewhat together. Much of it’s driven by the economy; when things are good, we generally trust each other. An example: Trust in government rose under Reagan, because the economy was doing well. But trust in people declined over that same time, largely because inequality drove people apart. CG: So, institutional trust has a shorter time-span than generalized trust? EU: Yes. Institutional trust is the response to Ed Koch’s old question, “How’m I doing?” You look at the economics of the moment; that’s why presidents always try to have the economy’s wind at their backs going into an election, because people’s political trust is short-term. But social trust, that’s more a matter of long-term questions. Will life be better for my children? That doesn’t depend on the Fed, or the stock market. CG: Say more about that? Has social trust got to do with empathy? EU: Yes, but it’s much more than just empathy. You have to have a willingness to interact with people, and to see the world from different perspectives. It’s not that you have to change your mind, it’s just that you’ve got to concede that someone else’s reality may have as much validity as your own. And in the US, the Congress has come to reflect the same sort of denial of legitimacy that has characterized the Arab-Israeli divide for so long – a denial that the other side has any claim to decency. CG: Let’s get basic. 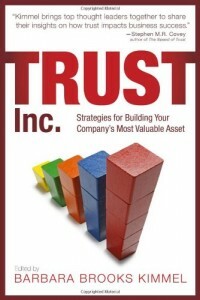 Is social trust valuable? Do we want it? Do we care? It’s not hard to trust my wife, the people in my church, or those I meet at my grocery store or my school. The question is, can I trust those who are different from me, and whose values I may not share? And by the way, the less those people shop at my supermarket or go to my kids’ schools, the less likely I am to trust them. CG: I was going to ask – what drives this kind of social trust? Or is that too vague a question? EU: It’s not too vague, but the answer requires two levels. First, people who have a high propensity toward social trust are a) optimistic about the future, and b) feel they have control over their lives. And people who have a low propensity toward social trust are the reverse – they believe the world is getting worse, and that it’s largely beyond their control (if not controlled by those “others”). CG: So – optimism and empowerment. EU: Yes – and now for the punch line, the second order drivers of those two. A propensity toward social trust is influenced by a) education, and b) economic inequality. The less educated people are, and the greater the income dispersion in society, the lower will be the social trust. CG: That makes some sense. EU: It makes more than sense. Denmark is one of the highest-trust countries in the world, and also has extremely high education rates, and very low rates of economic inequality. Equally important, economic mobility is far greater in Scandinavia (and even in the UK, these days), than it is in the States. CG: Why do education and income disparity drive social trust? EU: Education teaches people that their worldview is not the only worldview. It’s the touchstone of tolerance and appreciation. And economic disparity – at least past some tipping point, indicated by the ability of groups to migrate upward economically – is an indicator of hope, or of hopelessness. Also, the further apart we are economically, the less it appears to all that our fates are linked. CG: So where do we stand these days in the US, and in other countries? EU: We have increasingly solidified patterns of racial and economic segregation of housing. Social mobility is now behind that of dozens of other countries. In the US, the flight of the black middle class has left the double-whammy of economic and racial segregation, with no powerful social institutions to get people out. Segregated communities are dysfunctional across a plethora of indicators – both groups tend to identify more with in-groups, and less with the society at large. CG: What can business do? EU: Get involved in the larger society. It’s unfortunate that most business rhetoric has tended to work against any sustained effort to fight inequality. Historically, go look at what Coca Cola did in Atlanta, and what Henry Ford did in Detroit. Coke knew that good people wouldn’t want to move to a segregated city, so they became active in integration of schools. Henry Ford famously paid his people enough to be able to buy cars. If Ford had not been such a rabid anti-Semite, he might have had more influence on public policy on inequality. The more companies pursue their own interest, the more difficult it is for them to pursue bonds with their own community, which drives inequality even further. The prevailing ideology of business these days is at odds with the creation of a society that nurtures business; it’s very short-sighted thinking. CG: And on that light note, we’ll have to leave it. Please come back and chat some more, Ric, this has been extremely enlightening.